When it comes to online brokerage services, eToro.com is not exactly a new competitor in the industry. However, the firm has been changing and expanding its offerings over the years to now include a wide range of services it hasn’t offered before. Rising to prominence with the introduction of a social trading network, eToro has already created a name for itself. Today, we’re going to look at the brokerage and see what it has to offer, how it stacks up against competition, and whether or not it’s a good fit for you. At this point, eToro is not a newcomer to the fintech industry. Starting back in 2006 as ‘RetailFX’ in Tel Aviv, three entrepreneurs created eToro with a vision of making trading accessible to anyone, regardless of location, and to ultimately reduce people’s’ dependence on traditional financial institutions. With their vision in mind, the first iteration of eToro was born with a Visual FX trading platform to make the world of trading easier to understand through the help of graphic representations. A few years later in 2009, the eToro team introduced ‘WebTrader,’ an easy-to-use interactive online trading platform. WebTrader made it easy for newcomers to get started in the markets with an intuitive user experience but also included tools for more advanced traders to take advantage of. The team’s next step is where eToro cemented its place in the fintech world, leading it to win the Finovate Europe Best of Show for 2011. In July of 2010, eToro launched ‘OpenBook,’ the world’s first social trading platform. For the first time, anyone could join eToro and take advantage of the trading strategies employed by other top traders. The new platform attracted global attention and is one of the features eToro is so well-known for today. Since OpenBook, eToro has been continuing to grow and expand the services it offers clients. The firm later released a mobile app for both iOS and Android users that made WebTrader and OpenBook easily accessible on a mobile device then. Following the release of the app, eToro added stocks to the list of assets traders had access to in 2013. Previously, traders only had access to commodities, currencies, and a limited amount of other assets. At its current state, eToro has transformed substantially. 2015 launched the ‘new’ eToro where everything was combined into one easy to use interface. The following year the firm released “CopyPortfolios” to offer long term investment products driven by machine-learning engines and, most recently, eToro now supports a limited list of cryptocurrencies on the platform with more expected to be added over time. Now that we have a basic understanding of the company’s history, let’s dig deeper into the different features eToro offers traders and how it stacks up to the competition. One of the first questions many of us have when coming across a new platform we’re not familiar with is “is it legit?” Of course, there are entire brand reputation sites and documenters out there for you to do your own research, but we feel highly confident in saying yes eToro is legitimate and you don’t need to worry about the service being a scam. One of the first things that’s likely to catch traders off guard is the look of the platform. eToro doesn’t have the same muted look as a Bloomberg Terminal or TD Ameritrade’s ThinkorSwim, so it’s normal for traders to not expect the user interface. However, eToro was built on the idea of enabling more people to trade, so they opted for a user friendly and intuitive interface rather than a barebones one. In addition, eToro brokering services are provided by eToro (Europe) Ltd., a registered Cypriot Investment Firm (CIF). The firm is regulated by the Cyprus Securities and Exchange Commission (CySEC) and in the UK is authorized and regulated by the Financial Conduct Authority (FCA) and complies with the Markets in Financial Instruments Directive (MiFID). In the US, eToro USA LLC is registered with FinCEN as a Money Services Business. The answer is yes, eToro is a regulated company that takes compliance seriously — no worries there. 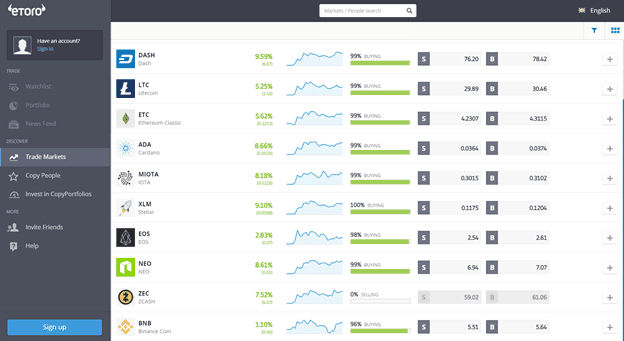 Depending on where you’re located, eToro has a long list of different assets for traders to choose from. Currently, the platform offers stocks, currencies, commodities (through CFDs), ETFs, indices, and now cryptocurrencies. Because of differing regulations, laws, and limitations, not all assets are available for trading globally yet. While eToro has stated that they’re always working on improving the platform and adding new functionality for users across the globe, there are limitations in place. For example, American investors on the platform are currently limited to cryptocurrencies and do not have access to stocks, commodities, or other assets. To get the full list of market hours and fees, visit eToro’s market hours and fees page. Next up, let’s take a look at the special features offered by eToro over many of the competitors. After all, the features realm is where eToro stands out the most from many other brokerages, especially in its social trading options. Let’s break them down. 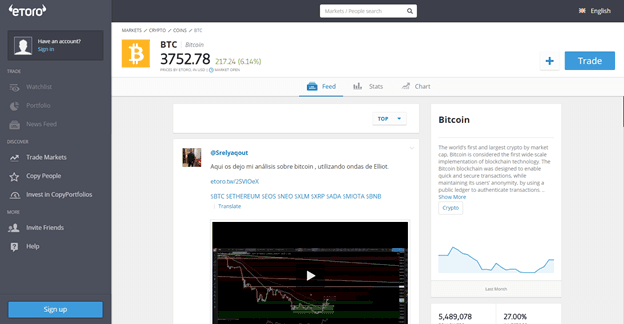 The feature the platform is best known for, eToro takes a social approach to trading, regardless of asset class. Logging into eToro and using the news feed feels very similar to Twitter, Facebook, or another social media platform, but for traders. You can follow traders you like or use the feed to stay up to date on the latest market happenings. If you find traders that you like, then users can utilize the Popular Investor Program to invest their money in the same way. Are you a rockstar trader who can consistently generate strong returns and mitigate risk in an effective manner? If you are, then eToro allows you to join the Popular Investor program. In the program, other users may decide to copy your trades and when they do, you’ll get paid a commission for it. As a part of the social trading aspect and commissions, eToro’s users are able to copy the trading strategies of popular investors. You’ll be able to look through different traders, risk levels, their trading history and portfolio, and even a selection of top investors from eToro editors. From here, users can decide to copy another trader completely, or just specific investments from their strategy. And in case things should go south, investors also have the ability to create a stop-loss when copying a trade to mitigate the potential losses. One of the newer features implemented on eToro, CopyPortfolio- is similar to copying trades, but with a long term investment approach. CopyPortfolio allows users to browse through a list of investments approaches for a greater time period and copy those strategies either entirely, or selectively, with their own funds. Like CopyPortfolio, users can look through previous fund performance, how it’s allocated, and a given risk score for. Not only does eToro include market updates from others on the social trading platform, but once registered, users gain access to a lot of helpful educational material and research, free of charge. With eToro’s “Trading Academy,” users get access to trading videos, live webinars, and e-courses for traders of all skill levels. All you have to do to access the material is be registered. Clearly, eToro has a lot of unique features on the platform that many other brokerages lack. But beyond its social trading aspect, one of the other top factors that makes us rate it highly is the ease of use of the platform and intuitive design. As we touched on earlier, eToro has a great user interface and feels less clumsy compared to traditional brokerages. That fact translates to an overall high level of user satisfaction from the platform and is definitely a strong advantage for brokerage, much like competing services like Coinbase for cryptocurrencies and Robinhood for equities. In addition to the ease of use, eToro is also great for beginners by allowing them to start with virtual currency trading (i.e. “paper money”) so that new traders can see how their trades will playout if they were to invest real money, all without the actual risk up front. After developing some experience with virtual trading, users can then easily fund their account and begin trading with real money. There is a minimum deposit amount of $1,000 and deposits can only be made via domestic wire transfer for US customers — though different countries have different requirements — both of which are factors to keep in mind. Outside of the US, other funding options include: all major credit cards, PayPal, Neteller, Skrill, WebMoney, Giropay, and Yandex Money. With all the features, educational resources, and usability of eToro’s platform, it’s not difficult to see why the brokerage has been so successful over the years. As the company continues to expand and grow its offerings into new markets like the US, eToro is definitely on the top of our list of brokerages to consider. If you’re still a newcomer to the markets, then eToro is an excellent option due to its user interface and educational content. Account creation and registration are simple and pain free so you’ll be able to get off the ground quickly. If you’re a more experienced trader, then eToro has more advanced options for you to take advantage of like adding leverage to your positions and trading CFDs. No matter your skill level, eToro has something for everyone.